Nov. 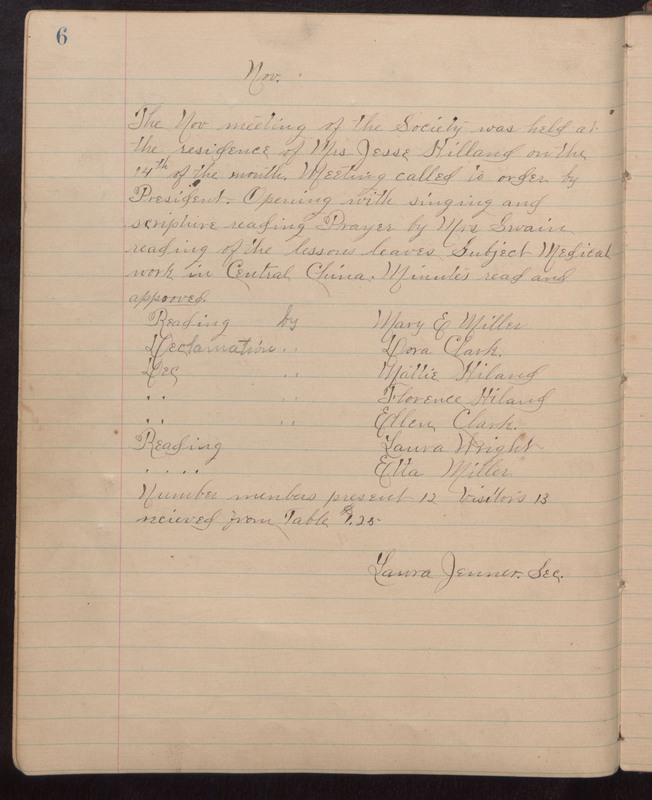 The Nov. meeting of the Society was held at the residence of Mrs. Jesse [Killand?] on the 14th of the month. Meeting called to order by President. Opening with singing and scripture reading Prayer by Mrs. Swain reading of the lessons leaves Subject Medical work in Central China. Minutes read and approved. Reading by Mary E. Miller Declaration ' ' Dora Clark. Dec ' ' Mallie [Hiland?] ' ' ' ' Florence [Hiland?] ' ' ' ' Ellen Clark. Reading Laura Wright ' ' ' ' [Elta?] Miller Number members present 12 Visitors 13 Recieved from Table $1.25 Laura Jenner, Seq.